Making his debut for Capri Records, baritone saxophonist Gary Smulyan mixes the power of his instrument with the light, swanky flavour of organ jazz. The resulting vibes of Smul’s Paradise are intoxicating and different. It’s not every day that one gets to hear a baritone saxophonist fronting what is essentially an organ trio, yet that’s the setup here. B3-Hammond player Mike LeDonne, drummer Kenny Washington and guitarist Peter Bernstein complete the group and their repartee clearly helps the album win its name. Washington and Bernstein are largely tasked with holding the rhythm down, but they offer so much more than time-keeping. Washington’s fills are animated and his tempo is fluid, while Bernstein pops up in all the right places with bright, expressive soloing. The back-and-forth between Smulyan and LeDonne certainly matches the aforementioned pairing punch-for-punch. LeDonne draws the group together with his proficient playing and articulate chording, while Smulyan powers the locomotives with a gallant and distinguished performance. 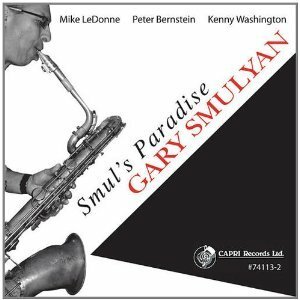 Smul’s Paradise is, in fact, a tribute to Patterson and three tracks pay tribute to the Philadelphia-born organist. Two are Patterson compositions (“Aries” and “Up in Betty’s Room”) and the third (“D. P. Blues”) is a Smulyan ode to the artist. Other tracks take different paths to the same swinging destination, like Rhonda Scott’s “Pistachio” with its slinky funk or the spacious, solo-ready title track. George Coleman’s “Little Miss Half Steps” is a welcome addition that packs potent drumming from Washington. Smul’s Paradise came together in a matter of hours with no rehearsal time. The music, as a result, sounds incredibly fresh and almost unbelievably energetic. There are no strained passages and no tawdry solos. Smulyan and the group deliver purely for the pleasure of it, honouring Patterson by playing as one.